The Ilkhanate, also spelled Il-khanate (Persian : ایلخانان‎, Ilxānān; Mongolian : Хүлэгийн улс, Hu’legīn Uls), was established as a khanate that formed the southwestern sector of the Mongol Empire, ruled by the Mongol House of Hulagu. It was founded in the 13th century and was based primarily in Iran as well as neighboring territories, such as present-day Azerbaijan and the central and eastern parts of present-day Turkey. The Ilkhanate was originally based on the campaigns of Genghis Khan in the Khwarazmian Empire in 1219–24 and was founded by Hulagu Khan, son of Tolui and grandson of Genghis Khan. With the fragmentation of the Mongol Empire after 1259 it became a functionally separate khanate. At its greatest extent, the state expanded into territories that today comprise most of Iran, Iraq, Armenia, Azerbaijan, Georgia, Turkmenistan, Turkey, western Afghanistan, and the Northwestern edge of the Indian sub-continent. Later Ilkhanate rulers, beginning with Ghazan in 1295, converted to Islam. The Mongolian language is the official language of Mongolia and both the most widely-spoken and best-known member of the Mongolic language family. The number of speakers across all its dialects may be 5.2 million, including the vast majority of the residents of Mongolia and many of the Mongolian residents of the Inner Mongolia Autonomous Region. In Mongolia, the Khalkha dialect, written in Cyrillic, is predominant, while in Inner Mongolia, the language is dialectally more diverse and is written in the traditional Mongolian script. In the discussion of grammar to follow, the variety of Mongolian treated is Standard Khalkha Mongolian, but much of what is to be said is also valid for vernacular (spoken) Khalkha and for other Mongolian dialects, especially Chakhar. 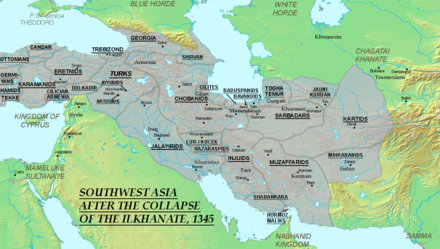 A khanate or khaganate is a political entity ruled by a khan or khagan. This political entity is typical for people from the Eurasian Steppe and it can be equivalent to tribal chiefdom, principality, kingdom or empire. Rashīd al-Dīn Ṭabīb, also known as Rashīd al-Dīn Faḍlullāh Hamadānī, was a statesman, historian and physician in Ilkhanate-ruled Iran. He was born into a Persian Jewish family from Hamadan. 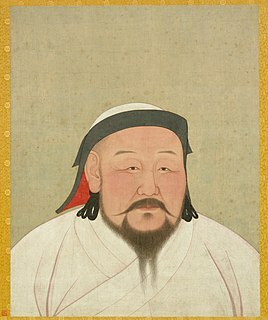 Kublai was the fifth Khagan of the Mongol Empire, reigning from 1260 to 1294. He also founded the Yuan dynasty in China as a conquest dynasty in 1271, and ruled as the first Yuan emperor until his death in 1294. 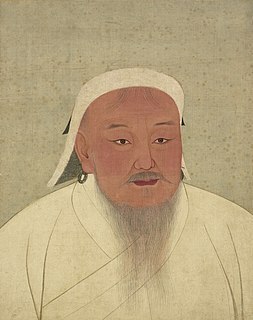 When Muhammad II of Khwarezm executed a contingent of merchants dispatched by the Mongols, Genghis Khan declared war on the Khwārazm-Shāh dynasty in 1219. The Mongols overran the empire, occupying the major cities and population centers between 1219 and 1221. 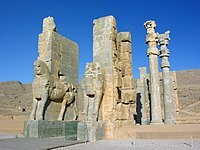 Persian Iran was ravaged by the Mongol detachment under Jebe and Subedei, who left the area in ruin. Transoxiana also came under Mongol control after the invasion. The undivided area west of the Transoxiana was the inheritance of Genghis Khan's Borjigin family. Thus, the families of the latter's four sons appointed their officials under the Great Khan's governors, Chin-Temür, Nussal, and Korguz, in that region. The Mongol conquest of Khwarezmia from 1219 to 1221 marked the beginning of the Mongol conquest of the Islamic states. The Mongol expansion would ultimately culminate in the conquest of virtually all of Asia with the exception of Japan, the Mamluk Sultanate of Egypt, Siberia, and most of the Indian subcontinent and Southeast Asia. Jebe was one of the most prominent Noyans (generals) of Genghis Khan. He belonged to the Besud clan, part of the Taichud tribe, which was under Targudai Khiriltug's leadership at the time of Genghis Khan. Even though Jebe was originally an enemy soldier, Genghis Khan recruited him and turned him into one of his greatest generals. Jebe played an important role in helping to expand the territory of Genghis Khan's empire. Despite playing a large role as a general for Genghis Khan, there are relatively few sources or biographies about his life. Jebe has been described as "the greatest cavalry general in history" for his unorthodox and daring maneuvers. Muhammad's son Jalal ad-Din Mingburnu returned to Iran in c. 1224 after his exile in India. The rival Turkic states, which were all that remained of his father's empire, quickly declared their allegiance to Jalal. He repulsed the first Mongol attempt to take Central Persia. However, Jalal ad-Din was overwhelmed and crushed by Chormaqan's army sent by the Great Khan Ögedei in 1231. During the Mongol expedition, Azerbaijan and the southern Persian dynasties in Fars and Kerman voluntarily submitted to the Mongols and agreed to pay tribute. To the west, Hamadan and the rest of Persia was secured by Chormaqan. The Mongols invaded Armenia and Georgia in 1234 or 1236, completing the conquest of the Kingdom of Georgia in 1238. They began to attack the western parts of Greater Armenia, which was under the Seljuks, the following year. Jalal ad-Din Mingburnu or Manguberdi, also known as Jalâl ad-Dîn Khwârazmshâh, was the last ruler of the Khwarezmian Empire. Chormaqan was one of the most famous generals of the Mongol Empire under Genghis Khan and Ögedei Khan. He was also a member of the keshik. Azerbaijan, officially the Republic of Azerbaijan, is a country in the South Caucasus region of Eurasia at the crossroads of Eastern Europe and Western Asia. It is bounded by the Caspian Sea to the east, Russia to the north, Georgia to the northwest, Armenia to the west and Iran to the south. The exclave of Nakhchivan is bounded by Armenia to the north and east, Iran to the south and west, and has an 11 km long border with Turkey in the northwest. Mosul is a major city in northern Iraq. Located some 400 km (250 mi) north of Baghdad, Mosul stands on the west bank of the Tigris, opposite the ancient Assyrian city of Nineveh on the east bank. The metropolitan area has grown to encompass substantial areas on both the "Left Bank" and the "Right Bank", as the two banks are described by the locals compared to the flow direction of Tigris. Möngke was the fourth khagan of the Mongol Empire, ruling from July 1, 1251, to August 11, 1259. He was the first Khagan from the Toluid line, and made significant reforms to improve the administration of the Empire during his reign. Under Möngke, the Mongols conquered Iraq and Syria as well as the kingdom of Dali. Yam was a supply point route messenger system extensively used and expanded by Genghis Khan and also used by subsequent Great Khans and Khans. The founder of the Ilkhanate dynasty was Hulagu Khan, grandson of Genghis Khan and brother of both Möngke Khan and Kublai Khan. Möngke dispatched Hulagu to establish a firm Toluid control over the Middle East and ordered him return to Mongolia when his task was accomplished. Taking over from Baiju in 1255 or 1256, Hulagu had been charged with subduing the Muslim kingdoms to the west "as far as the borders of Egypt". This occupation led the Turkmens to move west into Anatolia to escape from the Mongolian rule. He established his dynasty over the southwestern part of the Mongol Empire that stretched from Transoxiana to Syria. He destroyed the Ismaili Nizari Hashshashins and the Abbasid Caliphate in 1256 and 1258 respectively. After that he advanced as far as Gaza, briefly conquering Ayyubid Syria. Hulagu took with him many Chinese scholars and astronomers, and the famous Persian astronomer Nasir al-Din al-Tusi learned about the mode of the Chinese calculating tables from them. The observatory was built on a hill of Maragheh. The rudiments of double-entry accounting were practiced in the Ilkhanate; merdiban was then adopted by the Ottoman Empire. These developments were independent from the accounting practices used in Europe. This accounting system was adopted primarily as the result of socio-economic necessities created by the agricultural and fiscal reforms of Ghazan Khan in 1295-1304. 1 2 Komaroff 2013, p. 78. ↑ Badiee 1984, p. 97. ↑ Turchin, Peter; Adams, Jonathan M.; Hall, Thomas D (December 2006). "East-West Orientation of Historical Empires". Journal of World-systems Research. 12 (2): 223. ISSN 1076-156X . Retrieved 13 September 2016. ↑ Rein Taagepera (September 1997). "Expansion and Contraction Patterns of Large Polities: Context for Russia". International Studies Quarterly . 41 (3): 496. doi:10.1111/0020-8833.00053. JSTOR 2600793. ↑ Central Asiatic Journal. O. Harrassowitz. 2008. p. 46. ↑ "Despite numerous envoys and the obvious logic of an alliance against mutual enemies, the papacy and the Crusaders never achieved the often-proposed alliance against Islam". Atwood, Encyclopedia of Mongolia and the Mongol Empire, p. 583, "Western Europe and the Mongol Empire"
↑ David Morgan (2015-06-26). Medieval Persia 1040–1797. p. 64. ISBN 9781317415671. ↑ David Morgan (2015-06-26). Medieval Persia 1040–1797. p. 72. ISBN 9781317415671. ↑ Timothy May (2016). The Mongol Empire: A Historical Encyclopedia - Volume I. ABC-CLIO. p. 141. ISBN 9781610693400. ↑ Angus Donal Stewart (2001-01-01). The Armenian Kingdom and the Mamluks: War and Diplomacy During the Reigns of Het'um II (1289-1307). Brill. p. 182. ISBN 978-9004122925. ↑ Angus Donal Stewart (2001-01-01). The Armenian Kingdom and the Mamluks: War and Diplomacy During the Reigns of Het'um II (1289-1307). Brill. p. 181. ISBN 978-9004122925. ↑ Johan Elverskog (2011-06-06). Buddhism and Islam on the Silk Road. Harvard University Press. p. 141. ISBN 978-0812205312. ↑ David Morgan (2015-06-26). Medieval Persia 1040–1797. p. 73. ISBN 9781317415671. The Battle of Ain Jalut took place in September 1260 between Muslim Mamluks and the Mongols in the southeastern Galilee, in the Jezreel Valley, in the vicinity of Nazareth, not far from the site of Zir'in. Abaqa Khan, was the second Mongol ruler (Ilkhan) of the Ilkhanate. The son of Hulagu Khan and Lady Yesünčin, he reigned from 1265 to 1282 and was succeeded by his brother Tekuder. Much of Abaqa's reign was consumed with civil wars in the Mongol Empire, such as those between the Ilkhanate and the northern khanate of the Golden Horde. Abaqa also engaged in unsuccessful attempts at military invasion of Syria, including the Second Battle of Homs. Berke Khan was a Mongolian military commander and ruler of the Golden Horde who effectively consolidated the power of the Blue Horde and White Horde from 1257 to 1266. He succeeded his brother Batu Khan of the Blue Horde (West) and was responsible for the first official establishment of Islam in a khanate of the Mongol Empire. He allied with the Egyptian Mamluks against another Mongol khanate based in Persia, the Ilkhanate. Berke supported Ariq Böke in the Toluid Civil War, but did not intervene militarily in the war due to the fact of he also occupied in his own war. Amir Chūpān, also spellt Choban or Coban, was a Chupanid noble of the Ilkhanate, and nominal general of the Mongol Empire. His father was named the Malek of the Mongol Suldus clan. His ancestor was Chilaun (Чулуун), who was one of Chingis Khan's four great companions. The Chobanids or the Chupanids, were descendants of a Mongol family of the Suldus clan that came to prominence in 14th century Persia. At first serving under the Ilkhans, they took de facto control of the territory after the fall of the Ilkhanate. The Chobanids ruled over Azerbaijan, Arrān, parts of Asia Minor, Mesopotamia, and west central Persia, while the Jalayirids took control in Baghdad. Mahmud Ghazan was the seventh ruler of the Mongol Empire's Ilkhanate division in modern-day Iran from 1295 to 1304. He was the son of Arghun and Quthluq Khatun, continuing a long line of rulers who were direct descendants of Genghis Khan. Considered the most prominent of the Ilkhans, he is best known for making a political conversion to Islam in 1295 when he took the throne, marking a turning point for the dominant religion of Mongols in West Asia. His principal wife was Kököchin, a Mongol princess sent by his Khagan Kublai Khan. The Kurt dynasty, also known as the Kartids, was a Sunni Muslim dynasty of Tajik origin, that ruled over a large part of Khorasan during the 13th and 14th centuries. Ruling from their capital at Herat and central Khorasan in the Bamyan, they were at first subordinates of Sultan Abul-Fateh Ghiyāṣ-ud-din Muhammad bin Sām, Sultan of the Ghurid Empire, of whom they were related, and then as vassal princes within the Mongol Empire. Upon the fragmentation of the Ilkhanate in 1335, Mu'izz-uddin Husayn ibn Ghiyath-uddin worked to expand his principality. The death of Husayn b. Ghiyath-uddin in 1370 and the invasion of Timur in 1381, ended the Kurt dynasty's ambitions. Muhammad Khan was a claimant to the throne of the Ilkhanate. He was a great-grandson of Mengu Timur, who was a son of Hulagu. Sati Beg was an Ilkhanid princess, the sister of Il-Khan Abu Sa'id. She was the consort of amir Chupan (1319–27), Il-Khan Arpa, and Il-Khan Suleiman. In 1338–39, she was briefly the Ilkhanid khatun during internal conflicts, appointed by a Chobanid faction led by Hassan Kuchak. Suleiman Khan was a Chobanid puppet for the throne of the Ilkhanate during the breakdown of central authority in Persia. He was the great-grandson of the Ilkhan Hülegü's third son Yoshmut. Jahan Temür, son of Alafrang, was a Jalayirid candidate for the throne of the Ilkhanate in the late 1330s and the grandson of the Ilkhan Gaykhatu. Öljeitü, Oljeitu, Olcayto or Uljeitu, Öljaitu, Ölziit, also known as Muhammad Khodabandeh, was the eighth Ilkhanid dynasty ruler from 1304 to 1316 in Tabriz, Iran. His name "Ölziit" means "blessed" in the Mongolian language. Arghun Agha, also Arghun Aqa or Arghun the Elder was a Mongol noble of the Oirat clan in the 13th century. He was a governor in the Mongol-controlled area of Persia from 1243 to 1255, before the Ilkhanate was created by Hulagu. Arghun Agha was in control of the four districts of eastern and central Persia, as decreed by the great khan Möngke Khan. Wikimedia Commons has media related to Ilkhanate .